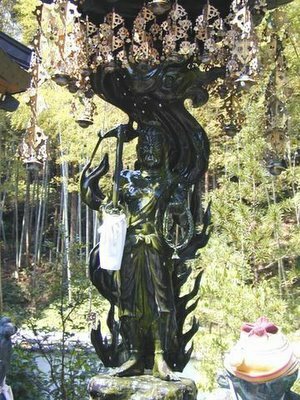 To throw water on the statue of a deity, that is a custom found in many places of Japan and the Buddha statues can vary. 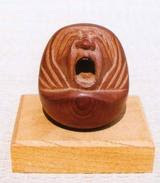 For example, Mizukake Jizo, Mizukake Kannon. The believer throws a ladle full of water over the statue and watches it drip down, hoping his wish will be fulfilled and his soul purified by this ritual. 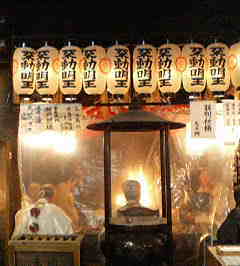 This is a pun with the word gankake 願掛け / 願掛 - to make a vow or say a wish for the deities to fulfill. 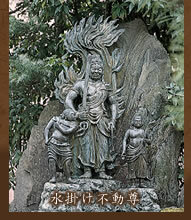 Here we will look at some Fudo Statues and Jizo Bosatsu. 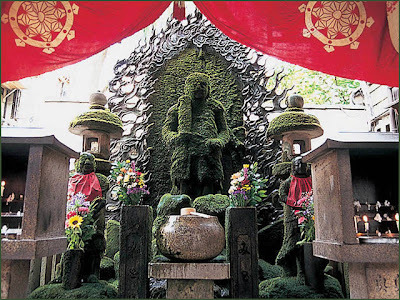 This statue is quite covered with koke 苔 moss by all the dowsing of water. People come here to wash away their sorrows and worries, but also there joys and pleasures, their detachment to this world in genera. 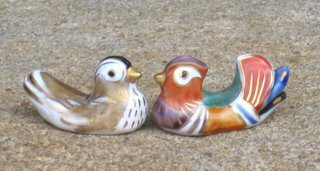 "mizu ni nagasu" is the Japanese expression. There are many paper lanters which give the place a special atmosphere and reflect on the pavement after people have thrown water on the statue. The precincts have two famous boards with calligraphy, one by the third Harudani Katsura on the east gate, and one by Kambi Fujiyama on the west gate. This temple is featured in some novels, too, for example the Stories of Osaka Life by Oda Sakunosuke. A life-size replica of the Buddhist deity Fudo Myo-o, (one of the Kings of Wisdom) at Hozenji in the Yokocho district of Osaka represents one of the most popular urban gathering spots Japan. Its folk history is well known through novels and songs. Here is a photo from the first fire ceremony of the year.
. Pilgrimages to 36 Fudo Temples 近畿三十六不動尊巡礼 . 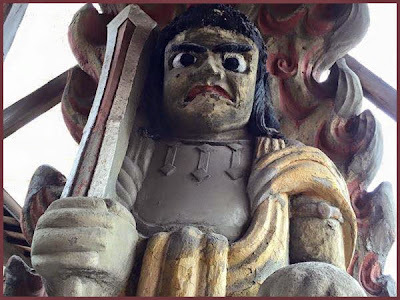 A Fudo where you can wash your money to double it.
. Temple Manman-ji (万満寺 - 萬満寺) Chiba .
. 36 Fudo Temples in Northern Kanto . 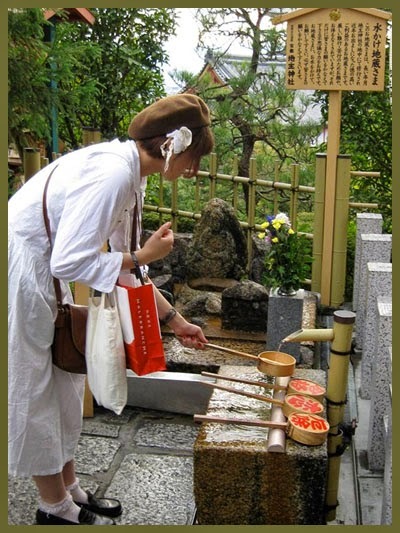 Mizukake Jizo at Jisshu Jinja 十種神宝　in Kyoto about to get a good dowsing of water..
. Jizo Bosatsu 地蔵菩薩 - ABC List . 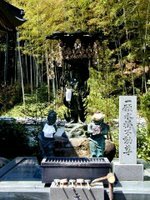 The upper half of a stone statue standing next to the popular Mizukake Fudo statue at Hozenji temple in the Minami entertainment district of Osaka was found toppled early Tuesday with its head and arms damaged, police said. A passerby found the 90-centimeter-tall statue, Seitaka Doji, damaged at about 5:30 a.m. and reported it to the police, who are investigating the case. 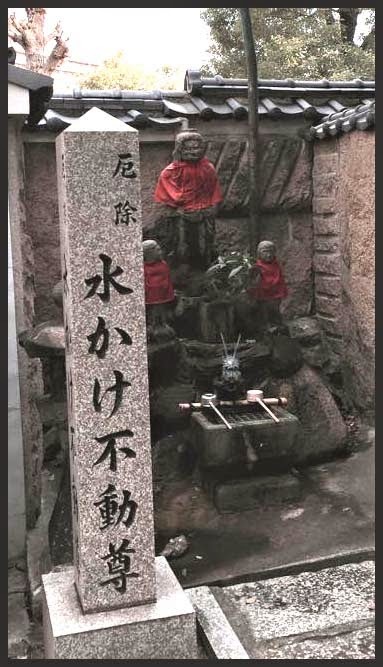 According to the police, the damaged statue was one of two small statues placed on either side of the Mizukake Fudo statue, the official name of which is Nishimuki Fudo Myoo. The damaged upper part of the Seitaka Doji statue was a separate piece from the statue's lower body. No irregularities were found when a temple worker checked the statue at about 11 p.m. Monday. The police are checking security video footage. 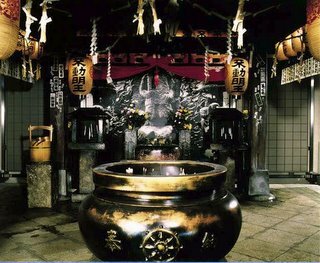 Well-wishers frequently visit the temple to pray for prosperity and good fortune, pouring water on Mizukake Fudo and its attendant statues. 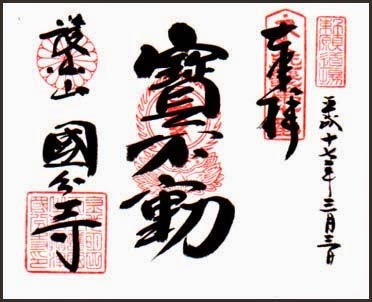 Mizukake Fudo appears in "Meoto Zenzai," a novel written by Sakunosuke Oda (1913-47), as a symbol of the Hozenji Yokocho court. Shinei Kanda, 28, deputy head priest of the temple, said: "It's like I lost a family member. We want to repair it as soon as possible." 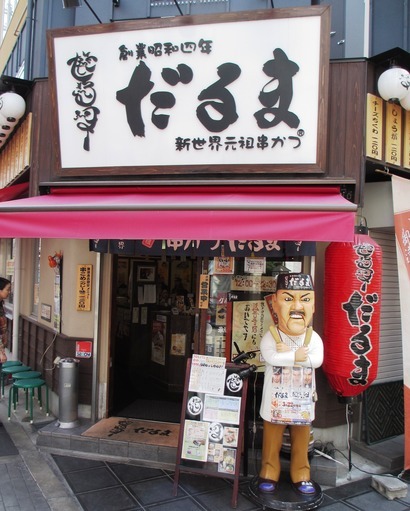 Toshio Matsui, 47, a restaurant operator of Higashi-Osaka, Osaka Prefecture, who visits the temple every month, said the vandalism was "a sinful act."